New York: Philosophical Library, 1950. First edition of Einstein's collection of social science-related articles, addresses and speeches. Octavo, original cloth, frontispiece of Einstein. Signed by the author on the front free endpaper, "A. Einstein 52." With the ownership signature of Dr. Milnor Alexander, Los Angeles, California, 1952 on front pastedown. Alexander taught political science at Penn State University and was active in the women's movement and supporter of many societies promoting social welfare, the environment and the Labor movement. She has also inscribed below, "Autographed by Einstein for our fund-raiser for the Federation for Repeal of the Levering Act." The inscription on the pastedown is significant. Einstein is known to have endorsed the [successful] fight against having every California citizen/employee of the government pledge complete loyalty to the government no matter one's political affiliations. This was called the Levering Act. These strictures to be imposed on California government employees took place during the McCarthy era of seeking out Communist sympathizers, including the banning of alleged Communist-leaning Hollywood actors and directors. Fine in a near fine dust jacket. Housed in a custom half morocco clamshell box. An exceptional association. 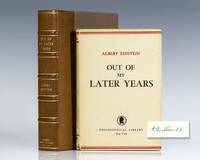 Out of My Later Years is Einsteins collection of essays considering everything that interests him as a scientist, philosopher and humanitarian. Einsteins essays share how one of the greatest minds of all time interprets the changing world of his time. New York: Philosophical Library, 1950. First edition of Einstein's collection of social science-related articles, addresses and speeches. Octavo, original cloth, frontispiece of Einstein. Signed by Albert Einstein on the front free endpaper. Fine in a very good dust jacket. Housed in a custom half morocco clamshell box. Out of My Later Years is Einsteins collection of essays considering everything that interests him as a scientist, philosopher and humanitarian. Einsteins essays share how one of the greatest minds of all time interprets the changing world of his time. New York: Philosophical Library, 1950. 1st Edition 1st Printing. Hardcover. Fine/Fine. 282 Pp. Dark Blue Cloth, Gilt. Pages Are Exactly Same As Issue In Light Blue Boards, Including Title And Copyright Pages, But Binding Is Cloth. Dj Priced $4.75, Same As Issue In Blue Boards, But Dj Is Gray, Red-Brown And White, With Author In Red-Brown And Title In White Book Is Fine, No Damage, Dj Is Also Fine. This Issue With The Book Find News Issue Featuring This Book With A Review By Harlow Shapley, Showing This Dj On P. 2, Offering It For $1.75 Rather Than The Dj Price Of $4.75; Harlow's Review Is Discussed On The Front Flap Of The Dj. .
New York: Philosophical Library, 1950. 1st Edition Printing Unknown. Hardcover. Near Fine/Fine. 282 Pp. Light Blue-Green Boards Stamped In Dark Blue. First Ediiton But A Later Printing. Pages Are Exactly Same As Issue In Dark Blue Cloth/Gilt, Including Title And Copyright Pages, But Binding Is Paper Covered Boards Rather Than Cloth; Dj Priced $4.75, Same As Issue In Blue Cloth, But Dj Is Light Tan Printed In Red And Black With Philosophical Library Name And Logo On Front Cover (Cloth Issue Has A More Complex Dj Design With Author In Red-Brown And Title In White); Back Panel Lists 19 Titles, Including Several Published In 1946-1952. Book Is Fine, No Damage, Slight Browning Along Top And Bottom Edges. New York: Philosophical Library. 1950. First Edition; First Printing. Hardcover. Very Good in a Very Good dust jacket. Chip to jacket crown at spine. Edgewear. ; 8vo 8" - 9" tall; Original unclipped dust jacket protected by archival Brodart cover. All domestic orders shipped protected in a Box. .
New York: Philosophical Library. 1950. First Edition; First Printing. Hardcover. Very Good+ in a Very Good+ dust jacket. Foxing to page ends. Closed tear to bottom front panel some edge wear. ; 8vo 8" - 9" tall; Original unclipped dust jacket protected by archival Brodart cover. All domestic orders shipped protected in a Box. .
New York: Philosophical Library. 1950. First Edition; First Printing. Hardcover. Very Good in a Very Good dust jacket. Chipping to jacket. Owner inscription to FEP. Markings to jacket at front panel. ; 8vo 8" - 9" tall; Original unclipped dust jacket protected by archival Brodart cover. All domestic orders shipped protected in a Box. .
2016-08-30. Good. Ships with Tracking Number! INTERNATIONAL WORLDWIDE Shipping available. May not contain Access Codes or Supplements. May be ex-library. Shipping & Handling by region. Buy with confidence, excellent customer service! 2016-08-30. New. Ships with Tracking Number! INTERNATIONAL WORLDWIDE Shipping available. Buy with confidence, excellent customer service! Random House Value Publishing, 1990-02-28. Revised. Hardcover. Used:Good. New York: Philosophical Library. Very Good+ in Very Good+ dust jacket. 1950. Hardcover. The beliefs and philosophies of the noted scientist. A nice, early edition; 8vo; 282 pages . New York: Philosophical Library. Very Good+ in Very Good- dust jacket. 1950. Hardcover. DJ browned and with light chipping. Rough spot on front free endpaper from removed sticker. ; The beliefs and philosophies of the noted scientist. A nice, early edition; 8vo; 282 pages . New York: Philosophical Library. 1950. First Edition; First Printing. Hardcover. Very Good in a Very Good dust jacket. Some soiling with chips and tears including a larger chip at the top of jacket front. ; 8vo 8" - 9" tall; Original unclipped dust jacket protected by archival Brodart cover. All domestic orders shipped protected in a Box. .
N.Y., Philosophical Library, (1950). Orig. full cloth. Very light wear to spine ends. (7),282 pp. ¶ First edition. Schilpp:446 - Weil: Appendix. New York: Philosophical Library. 1950. First Edition; Early Printing. Hardcover. Near Fine in a Fair dust jacket. Edge wear. Marker to front panel. Soiling to front and rear panels. Chip to spine's crown. ; 8vo 8" - 9" tall; Original unclipped dust jacket protected by archival Brodart cover. All domestic orders shipped protected in a Box. .
Citadel Press, 2000-10-01. Paperback. Used:Good. PHILOSOPHICAL LIBRARY. NY 1950. Fine. 1950. First Edition. Hardcover. 0802204392 . Fine in a Vg. dj. (Bookplate underneath front dj. flap on pastedown. Price on dj. flap inked over. Touches of soiling to dj. Shallow chipping at spine ends, without affect on titles) . Citadel Press. PAPERBACK. 0806503572 New Condition. . New. Philosophical Library/Open Road. PAPERBACK. 1453204938 New Condition. . New. Random House Value Publishing. Hardcover. 0517694174 New Condition. . New. New York: Philosophical Library, 1950. 282 pp. White endpapers. Blue cloth with navy titles. Corners bumped, top and bottom edges slightly yellowed. Beige DJ with red and black titles, not price-clipped. Light wear along the edges. VG+/VG+. Philosophical Library, New York. Hardcover. First edition. Rub to extremities else very good in very good little rubbed chipped dust jacket. . Very Good. 1950. New York: Philosophical Library. Good in Good dust jacket. 1950. Hardcover. DJ price clipped and edgeworn. ; 8vo . Philosophical Library/Open Road. PAPERBACK. 1453204938 Like New Condition. . Fine. New York: Philosophical Library, 1950. A superb, unclipped copy in a Mylar cover.. First Edition. Cloth. Fine/Near Fine. Octavo. Random House Value Publishing. Hardcover. 0517694174 Like New Condition. . Fine. Citadel Press. PAPERBACK. 0806503572 Like New Condition. . Fine. New York:: Philosophical Library,, (1950.). Very near fine in blue cloth in a very good dustjacket (toning to the spine of the dj, edgewear.).. Hardcover. A collection of essays written after 1936, including many never before published, on a variety of topics ranging from a self-portrait to science to public affairs and world affairs, including the idea of mass destruction. One section is devoted to scientists through the years and the final section on "my people" deals with being Jewish and the history of the Jews. Index. 282 pp. Condition: Very near fine in blue cloth in a very good dustjacket (toning to the spine of the dj, edgewear.). Philosophical Library. Used - Acceptable. Former Library book. Shows definite wear, and perhaps considerable marking on inside. New York: Philosophical Library, 1950. 6/24/2008. Good. First edition. Lacking the dustwrapper, offset front endpapers and soiling thus good. Philosophical Library. Collectible - Very Good. New York: Philosophical Library, 1950. 1st edition. 8vo Hardcover 282 pgs. Very Good Book. Good Dust Jacket. Top-edge foxed. Closed tear to dust jacket. Inquire if you need further information. New York: Wings Books. 1993. Revised Edition. Hardcover. 0517093804 . Very Good in a Very Good dust jacket. Creaes to front flap. ; 7.80 X 5.50 X 1.20 inches; 288 pages; Original unclipped dust jacket protected by archival Brodart cover. All domestic orders shipped protected in a Box. .
Greenwood Pub Group, 1995-06. Hardcover. Good. New York: Philosophical Library, 1950. Small DJ edge closed tear; price clipped' else a near fine copy, clean and unmarked in a Mylar DJ cover.. First Edition. Hard Cover. Fine/Very Good. Illus. by Portrait Frontispiece. Octavo. Citadel Press. PAPERBACK. B0007E5FV8 . New. 1st . Unknown/Unknown. 1st . Unknown/Unknown. 1950, Phiosophical Library, NY, 1st, ". Personal Credos. Profound Convictions. Social, Religious, Educational and Racial Relationships and The Problem Of Peace. " a beautiful book of Einsein's humanist concepts, Science, Philosophy, Essays. NY: Philosophical Library. F/VG-. 1950. 1st Ed.. HC. Dj is is chipped at top end with wear at lower end + soiling on rear panel with rubbing along folds. Darkening on spine. Front o . f dj is attractive and copy is still presentable. Science .